"If they [Republicans] want to debate it tomorrow for a period of time, they can do that, but I'm going to -- I think this piece of legislation is about as weak and senseless as anything that has ever come on this Senate floor, and I am not going to waste the Senate's time day after day on this piece of legislation which I think is an anathema to what our country is all about. So everyone understand, we're going to have a vote tomorrow. I'm not going to wait until Saturday. We're going to have a vote tomorrow. I feel confident that this legislation will be disposed of one way or the other. The American people should understand that this is a bad piece of legislation. 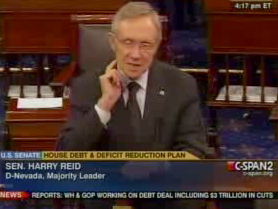 Perhaps some of the worst legislation in the history of this country," Sen. Harry Reid (D-NV) said on the Senate floor. Reid said he would allow debate of the bill that passed in the House earlier this week. A vote is scheduled for Friday. Dem Senator: "Cut, Cap, And Balance" Is "Cut, Cap And Kill Medicare"